‘Slack action’ refers to the free movement experienced by the boxcar of a train, when the car coasts free, neither pushed nor pulled. Jeffery Donaldson’s fifth collection, in which single words, images and even poems coast free, suggests that all life is middle life, and that we live in a present moment that coasts between a beginning we can’t remember and an end we can’t predict. you keep trying to get a lid on. in truth from its own trappings. the old Tourettic jangler, and pop! as all get out. The very idea! looked askance at what’s inside. it’s the cranking that stirs him! like this every time around. 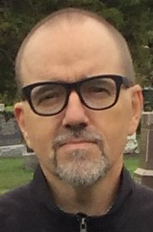 Jeffery Donaldson is the author of four previous collections of poetry, most recently Guesswork (Goose Lane, 2011). Palilalia (McGill-Queen’s, 2008) was a finalist for the Canadian Author’s Association Award for Poetry. He teaches poetry and American literature at McMaster University.